70L / 2.4 cubic feet capacity - largest in class! Huge 210L / 7.41 cubic feet capacity - Largest among competitors! Mixing cement is definitely a serious job. If done right, you can enjoy the beauty of a neatly created structure. 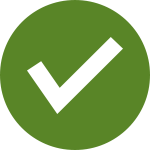 But if done wrong, you may end up with substandard, faulty and completely unsatisfying results. Here at Edisons, we try to save the day and make your cement mixing as easy, convenient and fast as possible. Here, we offer a great line of Baumr-AG Commercial and Portable Cement mixers designed to produce a stable and consistent mix in every load. 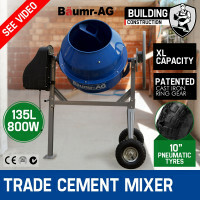 Built with an easy-load design, Baumr-AG Cement Mixers are ideal for render, mortar or concrete. They come with great features like the dual fast-mix blades, full IP55 rated controls and a solid reinforced frame for durability. 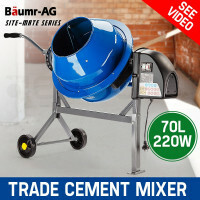 When you buy a Baumr-AG Cement mixer, you can also enjoy using the easy-load drum design, a balanced easy-tipping mechanism for easy pouring and a high grade tipper lock. Powered by a high-torque 240V 1500-watt motor, the Baumr-AG portable mortar mixer can hold up to 100 liters of mixing material. Made from highly durable materials like heavy-gauge steel, this compact cement mixer can survive the toughest conditions required for construction sites. This particular variant is ideal for processing rubberized bedding for playgrounds, self-levelling compounds, cement and sand mixes for screed beds, as well as dry and highly-viscous materials sand-filled epoxy mortars. It also caters for discharge into buckets and wheelbarrows with its adjustable chute and fold-down platform. Designed to work well in Australian conditions, Baumr-AG Cement mixers come with an extensive 1 year warranty to keep you completely satisfied. They are also made with versatility in mind to facilitate different positions for emptying, mixing, loading and storage. When you purchase your next cement mixer in Sydney, Melbourne or any other location in Australia, be sure to check out the other durable and effective construction tools and equipment available at Edisons. Here, we also sell Vacuums, Laser Level, Drill Bits, Nail Guns, Jackhammers and so much more. © 2017 Edisons. All Rights Reserved.